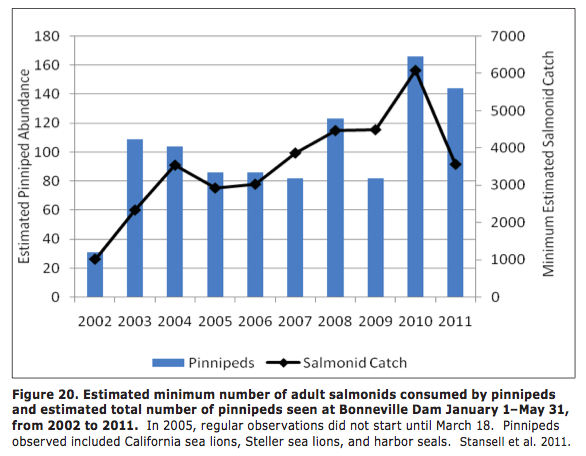 For the first time since the government started tracking, sea lions below Bonneville Dam this year killed more sturgeon than salmon. A new report by U.S. Army Corps of Engineers biologists said from January to June the California and Steller sea lions killed 2,498 sturgeon and 2,360 salmon at the dam. The estimated number of salmon killed -- the subject of years of lawsuits and millions of dollars on studies and deterrents -- is the lowest since the Corps began its extensive observation program in 2003. Bonneville is the first obstacle in the Columbia River for migrating salmon and steelhead. Some of the fish are listed as threatened or endangered by the federal government, prompting a massive and massively expensive effort to restore the runs. But during spring migration salmon pool up below the dam's fish ladders, making them easy pickings for sea lions that follow them up river. Two types of sea lions fish at the dam. California sea lions pursue just salmon. Steller sea lions -- much larger and protected by the Endangered Species Act -- eat both salmon and sturgeon. The corps' report credited the drop to killing or removing 38 of the most voracious California sea lions in 2008, 2009, 2010 and again this year. Lawsuits stopped removal of sea lions in 2011. With a new permit from the National Marine Fisheries Service, Oregon and Washington resumed removal this spring -- killing 12 California sea lions and sending one to a Chicago aquarium. The permit allowed killing up to 30. Final oral arguments in a lawsuit by the Humane Society of the United States to stop sea lion removal is scheduled Friday in U.S. District Court in Portland. For the past two years Steller sea lions have outnumbered California sea lions at Bonneville. Observers identified 39 California sea lions this spring, the lowest since 2003. In contrast, 73 Steller sea lions, the third-highest in 11 years, were identified. For the first time, the corps report said, Steller sea lions ate more salmon than California sea lions --1,293 compared with 1,067. Because Stellers are at the dam before and after the salmon migration, they also prey on big schools of sturgeon that live year-round below Bonneville's spillways. The corps said Stellers accounted for all sturgeon kills this spring -- 2,498, second-highest on record. National Oceanic and Atmospheric Administration is considering a request by Oregon, Washington and Alaska to take the eastern population of Steller sea lions off the threatened list, which would open the door to seeking permission to remove Stellers.